Place gingersnaps and almonds in food processor and process until almonds are finely chopped. Add butter and process briefly. Butter an 8-inch (20-cm) springform tin and line base with parchment paper. Press cookie crumbs into base and about 1 to 2-inches (2.5 to 5-cm) up the sides. Chill for 30 minutes. Whisk together cream cheese, yogurt, honey, orange rind and sugar. Pour boiling water into a small ramekin and sprinkle with gelatine. Stir for 1 to 2 minutes or until gelatine is dissolved. Pour through a strainer into cream cheese mixture and stir to combine. Spoon filling into chilled shell and chill for at least 2 hours or overnight. Combine redcurrant jelly, wine and brandy in a saucepan and bring to boil. Add figs and simmer gently for 10 minutes or until figs are softened. Remove figs and simmer for 4 minutes more or until slightly syrupy. Return figs and let cool. 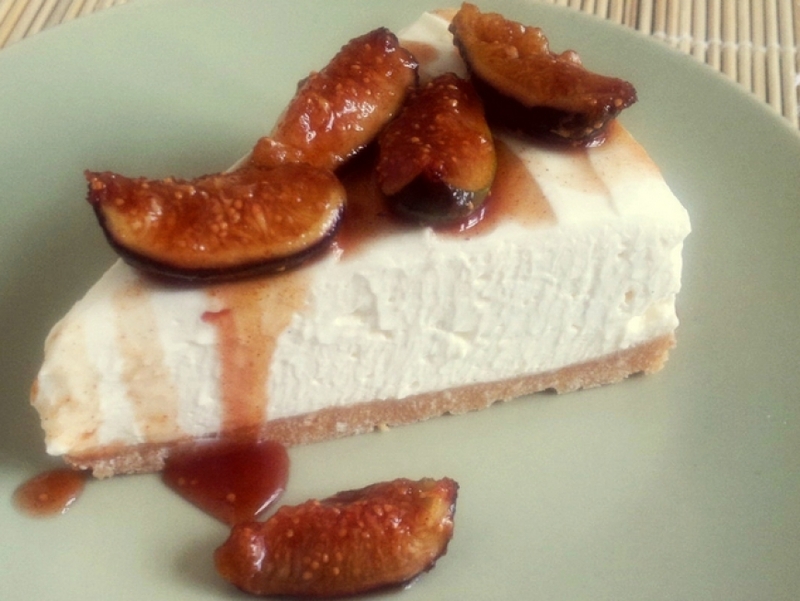 Serve figs as a garnish over the cheesecake.